“Meditation” is a broad term even within Buddhism. So broad in fact Buddhists may not even realise they have different things in mind when discussing meditation with one another. So, without further preamble, here’s my alphabetically ordered review of the meditation styles I’ve encountered and practiced on the Buddhist road. 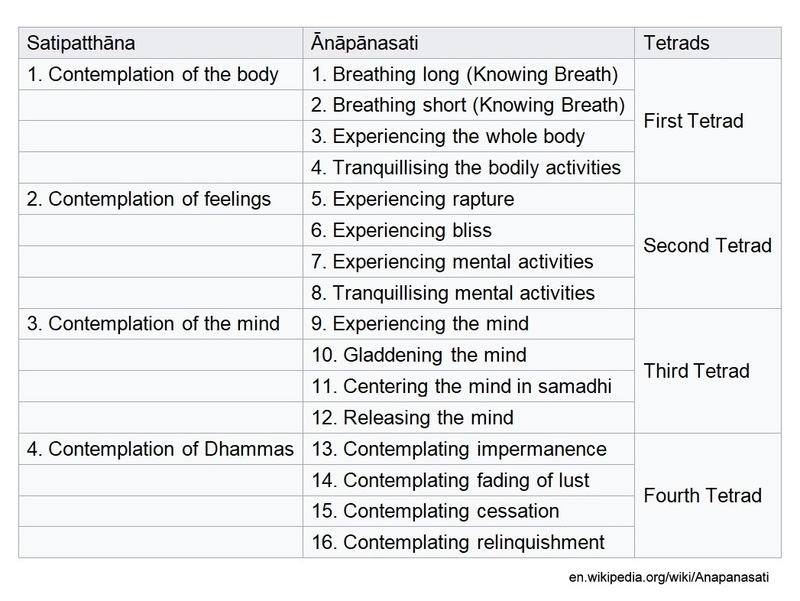 The Anapanasati Sutta  offers a detailed explanation of early Buddhist meditation; the sutta outlines sixteen steps and groups them into four tetrads or trainings, associating them with the four satipatthanas or “foundations of mindfulness” (see table below). “Mindfulness of breathing” or anapanasati is just the starting point. Having established a level of samadhi or mental absorption (also referred to as jhana or dyhana – see below), the early Buddhist practitioner would normally relax concentration to enjoy the samadhi experience or try to attain even higher states of absorption by remaining focused upon the breath. The practitioner might however choose instead to begin a four-fold contemplation of sathipattana (see below) for the sake of insight into the nature of lived experience. I practiced the jhanas on retreats and weekly classes with the Samatha Trust. The problem I had with just reading about the jhanas and practicing them alone at home was my tendency either to doubt my experience or convince myself that I’d attained a specific jhana when I hadn’t. Because of the potential hallucinatory effects of prolonged concentration on a single object, there is a substantial risk of compounding one’s delusions (or worse) with Jhana meditation, and I recommend doing it only when living a relatively simple life free from distractions (kind of like the Buddha’s early disciples) under the guidance of skilled tutors with a sound understanding of the appropriate Pali and Sanskrit texts. Lojong is a mind training practice based upon 59 aphorisms, exemplified by slogans such as “find the consciousness you had before you were born” and “maintain an awareness of the preciousness of human life”. These and other concise expressions of a general truth or principle are designed to counter the unwholesomeness of delusional thoughts and habits. They are intended to assist practitioners in relating to the world in a more constructive way, with an attitude of bodhicitta (“enlightenment mind”). Atisha Dipankara Shrijnana of Bengal is believed to have taught the practice in 11th century Tibet, where it was developed by subsequent masters over a period of 300 years into its present form. I find the effectiveness of each lojong expression depends upon its “stickiness” or memorability, and the one’s most likely to be recalled when needed are those having some direct personal relevance. I use them in the same way that I use the myths and legends I read in Buddhist scriptures – they serve me as portable aide memoirs that can be contemplated anytime or recalled in times of trouble to inspire energy and commitment to the The Path or Middle Way. The modern term “mindfulness” correlates roughly with the ancient Pali term “sati”, which referred to the traditional Buddhist practice of remembering or bearing in mind the four foundations of mindfulness (as expounded in the Sathipattana Sutta – see below) and discerning the moral power or quality of phenomena (i.e. wholesome or unwholesome?) as they arise in the present moment. Nowadays mindfulness is commonly associated with the practice of bringing “bare” or “non-judgmental” attention to present moment experiences, as popularised by stress-reduction therapist Jon Kabat-Zinn and members of the modern vipassana movement (see below) including Mahasi Sayadaw, Ajhan Sumedho, SN Goenka, Jack Kornfield, Sam Harris, et al. With practice it’s certainly possible to notice thoughts and emotions and states of mind arising and passing without getting involved. Desire, aversion, and boredom, for example, are entirely natural phenomena and nothing to get excited or feel guilty about. However, one of the kindest things I can do for others is to notice when these feelings are proliferating and neutralise them with countermeasure thoughts (e.g. the lojong slogans mentioned above or the sathipattana contemplations mentioned below) before they become too extreme and anti-social. Mindfulness is active and discerning – not passive and undiscriminating (see Satipatthana below). Contemplation on the Body (Kayanupassana). Includes contemplation on: Breathing or Anapanasati (see above); Postures (Walking, Standing, Sitting, Lying Down); Clear Comprehending or Sampajanna; Reflection on Repulsiveness of Body Parts (Hair, teeth, organs, bile, blood, faeces… etc. ); Material Elements (Earth, Air, Water, Fire); “Cemetery Contemplations” (nine visualisations of a decaying corpse). Contemplation on Feelings (Vedananupassana). Includes contemplation on: Pleasant or Unpleasant or Neither-pleasant-nor-unpleasant (Neutral) feelings; Worldly or Spiritual feelings. Contemplation on Thoughts (Cittanupassana). Includes contemplation on: knowledge of the arising or cessation of craving; aversion; delusion; vigour; tiredness; alertness; dullness; concentration; distraction; refinement; crudeness; high-mindedness; mean-spiritedness; expansiveness; restrictedness, etc. Contemplation on Teachings (Dhammanupassana). Includes contemplation on: The Hindrances; the Aggregates of Clinging; The Sense-Bases and their Fetters; The Factors of Enlightenment; The Four Noble Truths. The practitioner would contemplate each of the above four mindfulness bases until the appearing and dissolution of mind-states and their causes were truly understood; until the drawbacks of repeated birth, ageing, sickness and death were truly understood; until all phenomena were clearly comprehended and experienced as anicca, dukkha, anatta, resulting in disenchantment with the experience of living and a relinquishing of all attachments. You know you’re making progress with satipatthana when thoughts of eternal life or annihilation are seen as delusional and a sincere wish never to be reborn again arises spontaneously. Buddhist tantra eventually spread from India into neighbouring countries and as far as South Est Asia, and are today mostly associated with the Tibetan Vajrayana traditions. Originally regarded as secret teachings taught only by lineage holders to initiates with the right preliminary trainings, there are many meditation centers nowadays selling tantric books and courses and deity empowerments. When I studied tantra at a New Kadampa center I wasn’t really ready for it; I resented chanting and having to “play make-believe” and I didn’t stick at it long. However, I now know that it’s possible to change one’s personality by behaving congruently with an “ideal self” and learning new knowledge/skills to overcome any debilitating thoughts or contradictory habits. That’s basically how I rationalise tantra practice. As in the related practice of metta, the usual advice is to start small by working on your own issues first. Only after the practice has brought you good results should you then embrace the sufferings others, beginning with family and close friends and gradually extending the scope of your efforts to embrace the sufferings of strangers and animals and all conscious beings. One thing tonglen practice may do is to put your own problems in perspective; you may realise you actually have all you need to be of service to others who aren’t so lucky. Often translated as “insight”, early Buddhism regarded vipassana as clarity of mind in the present moment, a mental quality established through jhana practice. ,  In modern times, the term vipassana is commonly applied to a new Buddhist movement that favours a meditation technique developed by nineteenth century Burmese monks who were inspired by Buddhaghosa’s fifth century classic commentary, “The Path of Purification” (Visuddhimagga). The Burmese vipassana monks saw little need for mastery of jhana; their technique of bringing non-judgmental or “bare attention” to present moment experiences was intended to develop a level of “access concentration” sufficient enough for insight into the impermanent, unsatisfactory, and selfless characteristics of lived experience, and it employed the same meditation objects as recommended for jhana. The vipassana movement has since been very successful in recruiting secular-minded eastern and western converts who are unimpressed with traditional Buddhist references to karma, gods, and otherworldly rebirth destinations. Thai Forrest tradition is but one great example and Ajahn Chah, Ajahn Sumedho, Thanissaro Bhikkhu, et al are among the Buddhist teachers I’ve been most inclined to follow. Zazen is the practice of “just sitting” and is mostly associated with the Japanese Sotto Zen tradition and its founder, Dogen (1200-1252). I committed to the Buddhist path after reading Buddhism Without Beliefs by Stephen Batchelor , but it was Steve Hagen’s Buddhism Is Not What You Think  that inspired me to read Shunryu Suzuki  and other zen masters in order to meditate like them. Unlike the other forms of meditation I’d read about, zazen required no technique other than sitting still in some formal posture (ideally the lotus position) and observing material and mental phenomena coming and going without getting involved in them. The aim, if I can use that word when discussing zazen, is to maintain holistic awareness of the body-mind organism and its universal connectedness as opposed to concentrating single-pointedly on some meditation object (such as the breath). In zazen all is acknowledged and nothing is denied. Such total awareness leaves no room for discursive thoughts and what’s left is said to be “Original Mind” or “Buddha Mind” – the primordial mental state free from all concepts and incapable therefore of performing karma. Certainly I appreciate the 20 or 30 minutes of mental clarity I enjoy first thing in the morning as I sit and do nothing other than sense the motion of breath and body, the solidity beneath me, the spaciousness within and around me, and whatever else comes to mind. Off the cushion, however, I need to employ other techniques to help me recognise unskillful thoughts and dissipate them before they can proliferate and cause problems. The above list of meditations is by no means exhaustive but hopefully it’ll illustrate just how vague the word “meditation” is, and the difficulty it raises for anyone wanting to assess the “clinically proven” benefits and “scientific” endorsements frequently trumpeted by therapists and evangelists. These meditations are all worth reading up on and trying out with a trusted teacher, but it’s important to keep your impartiality and avoid being carried away by charismatic personalities and any euphoric feelings you may experience. Because your feelings about meditation will certainly change over time, and if you understand what the Buddha says about karma then you should know it’s highly unlikely that anyone else practicing the same technique will experience the exact same “benefits” you perceive. And how do we look after others by looking after our self? We look after our self by practicing continual observance of body, speech and mind; in doing so we protect others from our own ignorance. And how do we look after our self by looking after others? We care for others by showing them good will and friendliness and by refraining from harming, stealing, sexual abuse, lying, and intoxication; we give no one cause for offence or ill will and in doing so we protect ourself. “Meditation”, Wikipedia (accessed 21 May 2018). 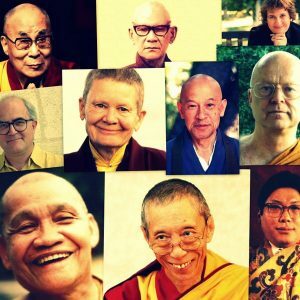 This article gives a useful overview of the different meditation traditions and practices and relates them all to one another in a fairly coherent manner with hyperlinks. “Anapanasati Sutta: Mindfulness of Breathing” (MN 118), translated from the Pali by Thanissaro Bhikkhu. Access to Insight (BCBS Edition), 30 November 2013. Search “Jhana” on Access to Insight and you’ll find 100 suttas referring to this practice. “Saleyyaka Sutta”, translated from the Pali by Nanamoli Thera. Access to Insight(BCBS Edition), 30 November 2013. “Samadhanga Sutta: The Factors of Concentration” (AN 5.28), translated from the Pali by Thanissaro Bhikkhu. Access to Insight (BCBS Edition), 30 November 2013. “Jhana Sutta: Mental Absorption” (AN 9.36), translated from the Pali by Thanissaro Bhikkhu. Access to Insight (BCBS Edition), 30 November 2013. “Lojong”, Wikipedia (accessed 21 May 2018). Ascetic Figures Before and in Early Buddhism: The Emergence of Gautama as the Buddha by Martin G. Wiltshire. Mouton de Gruyter, 1990. pp. 266-267. “Metta Sutta: Good Will (1)” (AN 4.125), translated from the Pali by Thanissaro Bhikkhu. Access to Insight (BCBS Edition), 30 November 2013. “Buddhavagga: The Buddha” (Dhp XIV: 183), translated from the Pali by Acharya Buddharakkhita. Access to Insight (BCBS Edition), 30 November 2013. “Satipatthana Sutta”, Wikipedia (accessed 07 June 2018). “The Foundations of Mindfulness: Satipatthana Sutta”, translated from the Pali by Nyanasatta Thera. Access to Insight(BCBS Edition), 30 November 2013. “The Great Establishing of Mindfulness Discourse: Maha Satipatthana Sutta”(DN 22), translated from the Pali by Thanissaro Bhikkhu, org (accessed 07 June 2018). “The Way of Mindfulness: The Satipatthana Sutta and Its Commentary”, by Soma Thera. Access to Insight (BCBS Edition), 30 November 2013. “Tantra”, Wikipedia (accessed 21 May 2018). “Vajrayana”, Wikipedia (accessed 21 May 2018). “Tonglen”, Wikipedia (accessed 21 May 2018). “One Tool Among Many: The Place of Vipassana in Buddhist Practice“ by Thanissaro Bhikkhu, org (accessed 07 June 2018). “Vipassana”, Wikipedia (accessed 21May 2018). Buddhism Without Beliefs: A Contemporary Guide To Awakening, by Stephen Batchelor, Bloomsbury, 1998. Buddhism Is Not What You Think, by Steve Hagen, HarperOne, 2003. Zen Mind, Beginner’s Mind, by Shunryu Suzuki, 1999. “Sedaka Sutta: The Bamboo Acrobat“ (SN 47.19), translated from the Pali by Andrew Olendzki. Access to Insight (BCBS Edition), 2 November 2013. This entry was posted in Commentary, Meditation. Bookmark the permalink.